As a result of Senate Bill Number 3 (SB-3), California has begun its ascent to reach a $15 minimum wage by the year 2022. However, Los Angeles put in place its own minimum wage ordinances, which will outpace the State’s increase beginning on July 1st, 2017. 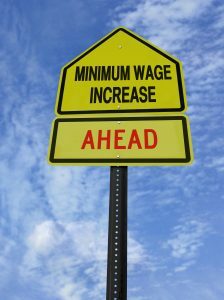 California’s minimum wage recently reached $10.50 on January 1st, 2017, but next week, employers with 26 or more employees that perform their work duties in the county or city of Los Angeles will be required to raise their minimum wage to $12.00 an hour. If a company's minimum wage employees are on a bi-weekly pay schedule, starting the next pay period, they may be entitled to wage increases. If the employees actually perform their work within Los Angeles City or Los Angeles County boundaries, and they are not public employees, then the new minimum wage law (starting July 1, 2017) affects minimum wage employees' pay rate in accordance with either the "small business" category (25 employees or fewer) or the "regular business" category (26 employees or greater). Employer must pay hourly minimum wage and provide paid sick leave for hours worked within the geographic boundaries of the City. Employer must post the Office of Wage Standards Wage and Sick Time Notice in a conspicuous place at any workplace or job site in English and any other language(s) spoken by at least five percent (5%) of the Employees at the workplace or job site. Employer must keep payroll records for four (4) years. Employer must provide employees with the Employer's name, address, and telephone number in writing at the time of hire. Employers will face administrative fines for violations of the ordinance. Each and every day that a violation exists constitutes a separate and distinct violation. As local and state wage laws get increasingly complicated. It’s up to employers to keep up with new bills and ordinances - or face large fines and even litigation. Another great option to ensure compliance is bringing in a PEO (Professional Employer Organization) firm under which an employer can outsource employee management tasks, such as employee benefits, payroll and workers' compensation, risk/safety management, wage and hours management and more.